Brandon Davis made a successful move to the bantamweight division, handing highly-touted newcomer Randy Costa his first pro loss via second-round submission. Costa rocked Davis immediately with a right hand, but the Atlanta native recovered well, and after returning fire, he locked Costa up and cleared his head. The two continued to exchange, both fighters getting in their share of shots, but Costa was landing the harder punches and kicks until a late surge by Davis, who bloodied the nose of his foe just before the horn. In the second round for the first time, Costa again drilled Davis with a right hand that wobbled the legs of “Killa B.” After another clinch, Davis got loose and hurt Costa with a kick to the head. Costa looked for a takedown, but Davis was able to scramble his way into control, and he quickly sunk in a rear naked choke that forced Costa to tap out at 1:12 of round two. With the win, Davis moves to 10-5. Costa falls to 4-1. Flyweight is the new division for Poliana Botelho and it felt like home for the Brazilian, as she won a hard-fought three-round unanimous decision over Lauren Mueller. Scores were 29-28 across the board for Rio de Janeiro’s Botelho, now 8-2. San Diego’s Mueller falls to 5-2. Botelho was busy with her striking from the start, and she clearly stunned Mueller with a thudding kick to the body in the second minute. With a little over three minutes to go, Botelho opted to take the fight to the mat, and the Brazilian continued to control the action. Mueller eventually got back to her feet and went to work in the clinch, but it was clearly Botelho’s round. After some clinch work against the fence in which Mueller started to get in a rhythm, Botelho took the fight to the mat in the third minute for a spell before another clinch the Brazilian controlled. Mueller had some success late, though, before the end of the frame. Down on the scorecards, Mueller went on the attack with under two minutes left in the fight, and she landed a few hard shots on Botelho before going back to the mat again. And while Mueller continued to do well there, she was unable to finish the fight. Up and comer Montel Jackson impressed in bantamweight action, as he outpointed Andre Soukhamthath via unanimous decision. Scores were 30-26, 30-27 and 29-27. Whether standing or on the mat, Jackson was calm, cool and collected through much of the first two rounds, with his offense and defense on point throughout. Suddenly with a little over two minutes to go in the second stanza, Jackson let loose with both hands and had Soukhamthath on the defensive. Yet just as suddenly, Jackson went back to a workmanlike game plan, capped off with a takedown and some ground strikes late. Looking to turn things around, Soukhamthath took Jackson down early in round three, only to be reversed by Jackson, who controlled matters the rest of the way with the exception of a brief armbar attempt by Soukhamthath with under 30 seconds to go. With the win, Milwaukee’s Jackson moves to 8-1. Rhode Island’s Soukhamthath falls to 13-7. Back on track after Geoff Neal snapped his four-fight winning streak in January, Belal Muhammad handed Curtis Millender his second straight defeat via unanimous decision in welterweight action. In a competitive first round, Millender (17-5) was the flashier of the two 170-pounders, but Muhammad (15-3) was able to get in his shots, with his left hook particularly effective as he pursued the Californian. Muhammad broke things open midway through round two, though, as he took Millender down and punished him for much of the frame. There was more of the same in the third, with Muhammad’s ground work the clear difference in the fight, which went to “Remember the Name” via scores of 29-27 twice and 30-26. 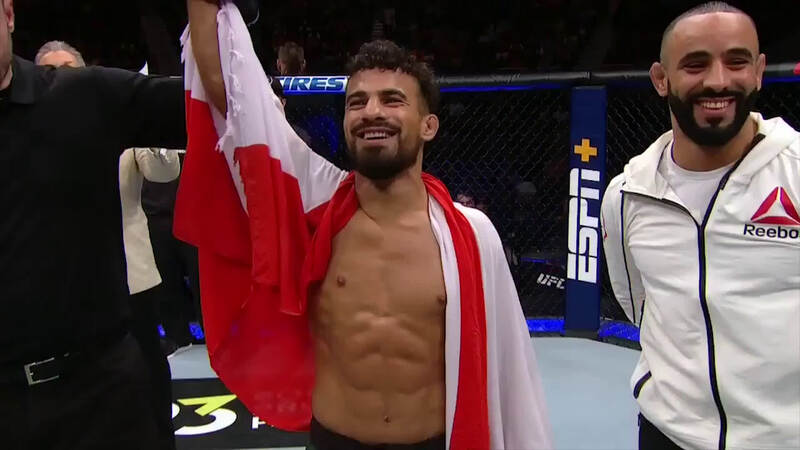 Khalid Taha’s first UFC victory was a spectacular one, as he stopped Contender Series alumnus Boston Salmon in less than 30 seconds. Back in action for the first time since July 2017, Salmon was caught cold by Germany’s Taha, who was throwing hammers from the start. A left hook dropped Salmon to the mat, and a series of right hands finished the job, with referee Blake Grice stepping in to stop the fight at :25 of round one. With the win, Taha moves to 13-2. Hawaii’s Salmon falls to 6-2. Welterweight rivals Max Griffin and Zelim Imadaev settled their score in the Octagon, with Griffin winning a close majority decision. Scores were 29-27 twice and 28-28 for Sacramento’s Griffin, who ups his record to 15-6. The Chechen Republic’s Imadaev falls to 8-1. Griffin opened the fight with a 1-2 to the head before putting Imadaev on the ground. The newcomer grabbed the fence twice and was immediately penalized a point by referee George Allen. When the action resumed, Griffin got another takedown and looked for a rear naked choke. Imadaev defended well for a spell and got back to his feet with a little over two minutes to go before landing a spinning elbow that got Griffin’s attention. Griffin continued to get his takedowns in round two, but fatigue was setting in and Imadaev was taking advantage with a series of flush strikes that had the Californian wobbly. And while Imadaev started out strong in the third, he began to fade late, allowing Griffin to get back on the board just before the bout went to the judges. 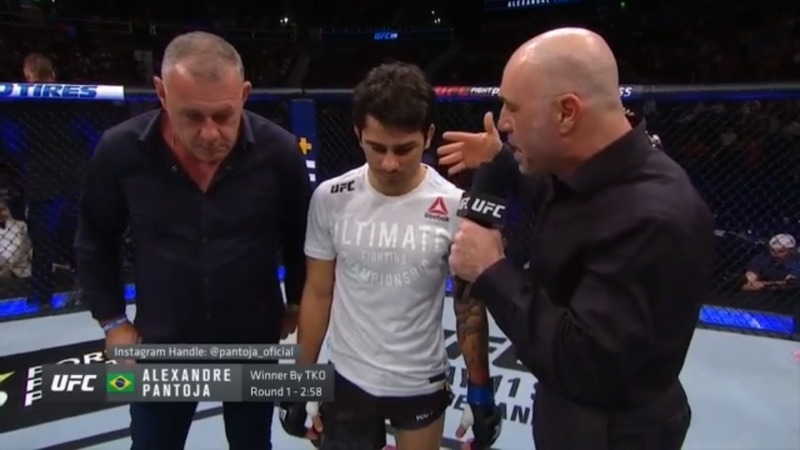 Top five flyweights met in UFC 236 prelim action, with Rio de Janeiro’s Alexandre Pantoja extending his winning streak to three with a first-round stoppage of Sao Paulo’s Wilson Reis. Pantoja had success with his striking early on, a precursor of things to come that was interrupted by a brief visit to the mat courtesy of a Reis takedown. But once standing, a straight right by Pantoja put Reis down, and after a follow-up barrage of strikes, referee Jason Herzog stopped the fight at 2:58 of round one. With the win, the No. 5-ranked Pantoja improves to 21-3. The No. 4-ranked Reis falls to 23-10. Contender Series alums Matt Frevola and Jalin Turner mat in a lightweight bout, with Frevola earning his first UFC win via unanimous decision. Scores were 30-27 across the board for Frevola, now 7-1-1. Turner falls to 8-5. Turner got taken down in the first 20 seconds and Frevola went to work, looking to sink in a rear naked choke. With two minutes gone, Turner got free and scrambled to his feet, rocking Frevola with a right hand. Another right followed moments later, prompting Frevola to seek – and get – another takedown. This time, Frevola got a guillotine in, but Turner got loose and then went on the attack before getting back to his feet. Turner worked behind his jab effectively in round two, and when he added in a guillotine attempt, it was a solid frame for him before a late surge by Frevola that included ground control and his own guillotine attempt. An illegal upkick by Frevola brought a halt to the action just before the end of the round, but Turner was cleared to continue. Frevola got the takedown just before the midway point of round three, but Turner didn’t stay there long. The New Yorker kept his eyes open for another takedown, and while Turner pressed with his striking attack, Frevola did get his opponent down just before the horn. Nikita Krylov avenged a 2014 loss to Ovince Saint Preux in the main card opener, submitting the light heavyweight contender in the second round. Krylov came out firing in the first round, but when he got too close, Saint Preux scored the takedown. Krylov rose quickly a couple times only to be grounded again by OSP, who got into full mount with under two minutes left. Krylov was able to escape and get back to his feet, with Saint Preux looking winded. Keeping the pace high, Krylov landed his share of strikes early in the second round before taking Saint Preux to the mat. He quickly got into the mount and then took OSP’s back. Krylov worked for a rear naked choke and got it, forcing Saint Preux to tap out at 2:30 of round two. With the win, Ukraine’s Krylov moves to 26-6. The No. 12-ranked Saint Preux falls to 23-13. Dwight Grant picked up his second consecutive win, taking a three-round split decision over Alan Jouban in a fairly uneventful welterweight bout. Jouban (16-7) scored a quick takedown to open the fight, but neither stayed grounded long. Once upright, Grant (10-2) was throwing hard and so was Jouban, but it was “The Body Snatcher” who landed the more telling blows in the first five minutes. The pattern continued in the second and third, with Jouban stalking and Grant landing the better shots, but neither doing enough to pull away. Jouban did get a takedown in the closing seconds, but it wasn’t enough to get “Brahma” the win, as Grant got the nod by scores of 29-28 twice and 27-30. A trip to train in Thailand did wonders for light heavyweight prospect Khalil Rountree Jr., who put together his best effort to date in scoring four knockdowns en route to a shutout decision over Eryk Anders. Rountree (9-3, 1 NC) began the fight firing kicks, and it didn’t take long for the California native to mark up Anders’ legs. And with nothing coming back at him, Rountree kept up the leg attacks, wrapping up an impressive first frame. Early in round two, a left hand dropped Anders (11-4) and Rountree followed up with more kicks to the leg. Anders took the shots and got back to his feet, but another left hand floored him moments later. Again, the gutsy Alabama product rose, but a third knockdown followed with a little over two minutes left. Rountree scored a fourth knockdown, and while the gutsy Anders kept getting up, the result of the fight was seemingly a foregone conclusion. Anders answered the call for the final round, and he waded into the fray once more, having his best round of the fight. There was no denying Rountree, though, as he earned the victory via identical scores of 30-26. All three judges saw it 48-46 for Adesanya, now 17-0. Gastelum falls to 16-4 with 1 NC. Gastelum pressed Adesanya to start the bout, but “The Last Stylebender” scored first with a hard kick to the midsection. With a little under three minutes to go, Gastelum knocked Adesanya into the fence with a right punch to the head, and while the Nigeria native recovered well, it was a key moment early in the bout, and Gastelum continued to keep the shots coming as Adesanya’s offensive output dipped. Adesanya came out throwing kicks to the body in round two, but Gastelum was undeterred as he shot his 1-2s upstairs. With just over two minutes left, though, a right hand stunned Gastelum and put him on the deck. Gastelum rose quickly, but Adesanya had earned his respect and the New Zealander began upping his work rate. A spinning elbow stunned Gastelum, who knew no direction but forward, and he landed a left hand before seeing a takedown attempt thrown aside. With two rounds in the books, the fighters had gotten acclimated to each other, resulting in some entertaining striking exchanged early in round three. But if there was an edge to be had, it belonged to Adesanya. Just before the final minute, Gastelum scored a takedown, but Adesanya bounced right up, and as the round ended, he appeared to be the fresher of the two. Gastelum took the fight to Adesanya to kick off the championship rounds, and that aggression worked well for him for a spell before the pace settled into one more to Adesanya’s liking. As the round progressed, Gastelum kept throwing, and while Adesanya’s defense was solid, he did ultimately emerge with a cut, prompting him to go after Gastelum with more bad intentions. With a minute left, Gastelum stunned Adesanya with a left kick to the head, causing the crowd to erupt. In addition to the cut, Adesanya’s face was swelling, and momentum was on Gastelum’s side heading into the fifth and final round. Gastelum marched forward and Adesanya fired back, ultimately stunning his foe with a right hand. As Gastelum looked for a takedown, Adesanya tried to lock up a guillotine choke and then a triangle as the two scrambled on the mat. After getting back to their feet, Adesanya drilled Gastelum with a right hand, forcing the Arizonan to lock up his opponent. 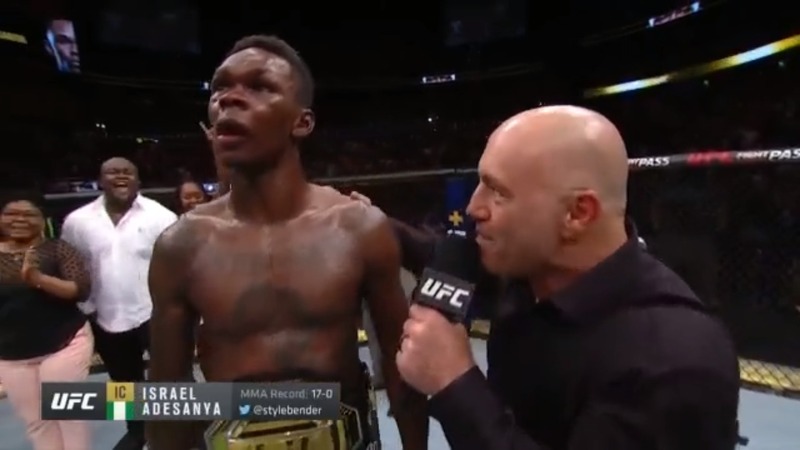 Adesanya pushed him off, though, and went back to work, determined to finish strong. With a little over a minute left, Gastelum was dropped briefly, and when he got up, Adesanya sent him back to the mat with a right hand. Now bloodied, Gastelum refused to give in, but Adesanya sent him down one more time before the final horn sounded, cementing his victory in a title fight that won’t be forgotten anytime soon. Hear what UFC Interim Lightweight Champion Dustin Poirier and Max Holloway had to say after their incredible fight at UFC 236. 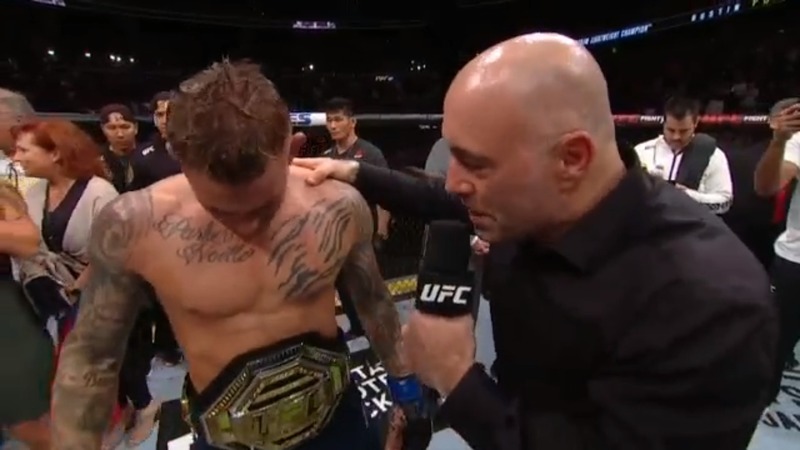 It wasn’t the same fight as it was in 2012, but Dustin Poirier repeated his victory over Max Holloway in the main event of UFC 236 in Atlanta’s State Farm Arena, this time earning the interim UFC lightweight title via five-round unanimous decision after a performance built by years of blood, sweat and tears. Scores were 49-46 across the board for Poirier, now 25-5 with 1 NC. Holloway, the UFC featherweight champion, falls to 20-4. It didn’t take long for the former foes to get reacquainted, Poirier first rocking Holloway, and Holloway then returning the favor. And while Holloway landed some hard shots on his opponent, Poirier drilled the Hawaiian with a right hand with a little over three minutes left, putting Holloway in deep trouble. Poirier emptied his arsenal on Holloway, and while the featherweight champ survived, Poirier’s power was rapidly becoming an issue. Holloway bounced back in the second round and began to pepper Poirier with shots as the two stood in the pocket, but late in the frame, Poirier’s power again made an appearance as he knocked Holloway into the fence after one exchange and then rocked him again just before the end of the stanza. Holloway’s face was busted up from the punishment of the previous two rounds, but “Blessed” kept throwing, and in the late stages of round three, his volume punching attack wasn’t being responded to by Poirier, allowing the Hawaiian to take the frame. Poirier got a takedown to begin round four, but he wasn’t able to keep his opponent there long, and when they rose, it was Poirier emerging with a cut and Holloway continuing to throw punches in bunches. Poirier soon got his second wind, and he opened up a nasty cut on Holloway’s forehead, but there was no quit in Waianae’s finest. The pace didn’t dip as round five began, with Holloway throwing at a greater clip while Poirier countered with pinpoint accuracy. Late in the frame, Poirier controlled matters in the clinch, with Holloway unable to break free, having given everything he had in search of victory. That desire was just as strong in Louisiana’s Poirier, and when it was over, he had done enough to finally put championship gold around his waist.